Every four years, political reporters flood western Pennsylvania searching for the latest clue to decipher the shifting allegiances of coveted “Reagan Democrats,” the socially conservative voters who abandoned the New Deal coalition over cultural issues in the '70's and '80's. When a candidate visits Pennsylvania, the accompanying news reports remind us that “Reagan Democrats” are the consummate swing voters who maintain a stranglehold over the outcome of critical races in large industrial Midwestern states like Ohio, Michigan, and Pennsylvania. But although Pennsylvania bears some resemblance to Ohio and Michigan, the winning Democratic formula there is completely different: The Reagan Democrats don’t hold the keys to a Romney win in the Keystone state—the Mondale Democrats do. Why the confusion? At first glance, Pennsylvania looks just like a Midwestern state. Western Pennsylvania has a reputation as an industrial hub, and Pennsylvania's demographic indicators—including median income, educational attainment, and race—are reminiscent of states like Ohio and Michigan. But over the last three decades, Pennsylvania's flagging manufacturing industry was superseded by a diversifying post-industrial economy. Even Pittsburgh, the city with a football team called the "Steelers," is now dominated by burgeoning health care, education, finance, and high-tech sectors. As a result, Pennsylvania's political character increasingly resembles the states of the Northeast and Mid-Atlantic, where similar economic and social changes have left Democrats competitive or leading in moderate, affluent, and educated suburbs, but trailing heavily in the working class hinterlands left behind by globalization. In the Midwest, by contrast, most suburbs lean decidedly Republican, leaving Democrats dependent on securing a near majority of the white non-college vote. In 2008, Obama's victories in the industrial Midwest were the product of a strong showing among whites without a college degree. In fact, between 40 and 50 percent of Obama voters in Ohio and Michigan were whites without a college degree, compared to just 27 percent of Obama's coalition in Pennsylvania—a tally more reminiscent of Virginia or Colorado than Ohio and Michigan. Even a quick glance at the map confirms the similarities between Pennsylvania and the Mid-Atlantic states. Obama carried Philadelphia and its well-educated suburbs, just as Obama carried Washington and the northern Virginia suburbs. Obama improved in the Germanic countryside of eastern Pennsylvania and Virginia, but struggled in Appalachia and the decaying industrial and coal towns further west where Democrats once excelled. In all three states—Pennsylvania, Virginia, and West Virginia—the 2008 results are a complete reversal from two decades ago. So why are we still talking about Pennsylvania as though it's the same state it was two decades ago, with the same Reagan Democrats ready to be fought over? 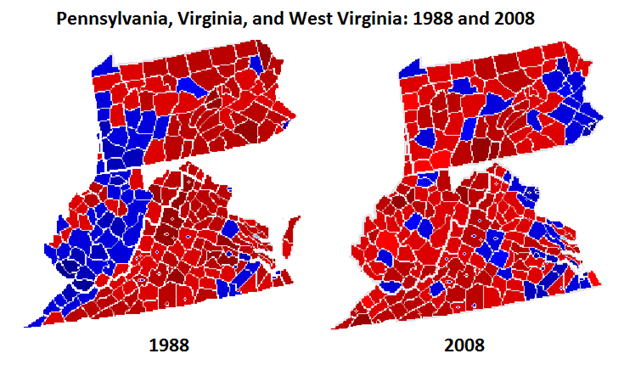 As you can see, Democrats haven’t won Pennsylvania by reclaiming the Reagan Democrats. Instead, Gore won by flipping Reagan Republicans in the Philadelphia suburbs, even while bleeding old supporters in western Pennsylvania. In 2008, Obama went even further, making additional gains in eastern Pennsylvania suburbs while outright losing eight of the nine counties that Mondale won in 1984. In Ohio and Michigan, Romney can win by peeling off Reagan Democrats and convincing white working class voters to return to the Republican fold. Pennsylvania is a completely different game. If the Romney campaign wants to win there, the Reagan Democrats won’t do them too much good; after all, Republicans have been winning the Reagan Democrats for thirty years. Instead, Romney needs to flip Mondale Democrats—the conservative but once Democratic-leaning voters of western Pennsylvania that even Reagan didn't win in 1984—as well as educated and affluent suburban voters in eastern Pennsylvania. 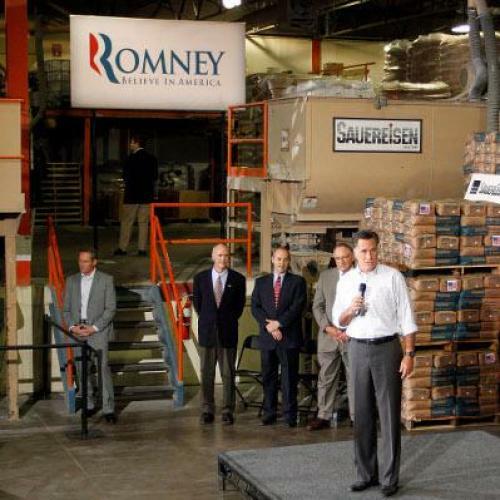 To be sure, Romney can't win with Mondale Democrats alone. Even if Obama lost a staggering 30 percent of his 2008 white working class supporters, he would still win 50 percent of the vote in Pennsylvania. In that scenario, he would win just 29 percent of the white non-college vote—worse than his performance among white working class voters in Tennessee. Instead, Romney will need gains among both Mondale Democrats and the well-educated and affluent voters outside of Philadelphia. But that still means that Reagan democrats are one group he should feel free to ignore.